"We wish you a happy New Year and look forward to conducting an inspection of any property you may be considering purchasing. Inspection of the property will ensure there are no hidden nasty’s that may emerge to surprise you in the future. Contact us for a quote." With the increasing frequency of properties being sold by auction, the need to know what you are buying is just as important, if not arguably more important, as buying under the traditional offer and acceptance purchase. We offer a pre-auction property inspection service to the same standard as offered through a Sale and Purchase Agreement. Welcome to our new website outlining the services we offer to prospective purchasers and sellers of a residential property. The service offers piece of mind prior to signing and being locked into the Sale and Purchase Agreement, and no surprises later on. This report is based on experience and reasonable opinion however is not a guarantee against moisture ingress at the time of inspection or in the future. This inspection has been done to the writer's best ability with all reasonable care taken using visual and non-invasive testing with meters as noted. This report is a guide only (as per NZ Standard) and not a guarantee against moisture ingress or structural failure and is to be accepted as such by the owner. The inspection of electrical components, plumbing and drainage has not been carried out by a registered person and is a visual inspection only. All reasonable attempts have been made to identify any significant defects visible at the time of the inspection. The inspector has not moved furniture, fixtures, stored items, soils, plants, checked window/door locks, etc at the time of inspection. He cannot see inside walls or other concealed areas and cannot detect damage or defects that are not visible in most cases. Some defects with the aid of testing equipment which was used at the time of inspection but these tools have limitations and cannot detect defects in all circumstances. It is confirmed that no detailed geotechnical investigation has been included in this brief. An investigation of the condition and location of underground drainage and services and of electrical, gas and plumbing (except as otherwise may be described in this report) is not included in this brief. As concrete and timber or particle board flooring is generally covered by floor coverings no liability can be taken for any cracking or deterioration that is not able to be seen. Whether or not services have been used for some time prior to an inspection being carried out may affect the detection of leaks and other defects. For example, in the case of a shower enclosure, the absence of any dampness at the time of inspection does not necessarily mean that the enclosure will not leak. A non-invasive moisture meter was used as an aid in this inspection. This in itself cannot be used to confirm or eliminate the possibility of moisture or deterioration in the framing timber or underlying materials. It is of limited use with some plaster systems and other factors. With claddings such as Polystyrene and Harditex or similar where there may be no cavity between the cladding and the framing there is no guarantee that moisture ingress has not occurred and will not do in the future. There is also no guarantee where houses built in high wind zone areas or when there is heavy rain and winds that the house will not leak. This property report is not a Code of Compliance Certificate or a Certificate of Acceptance under the Building Act. 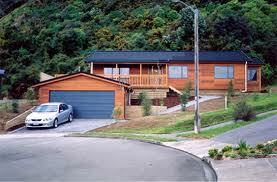 It is also not a statement that the property complies with the requirements of any other Act, regulation or by-law. Nor is this property report a warranty against problems developing with the building after the date of this report. This inspection should not be confused with an appraisal, building code inspection or any guarantee of any kind, but as a tool to aid you to be better prepared and knowledgeable. (q) window/door locks, bolts, etc. (r) any other factors limiting the preparation of this report. In terms of local Government Act; it is an offence for any person to lead or divert surface water from roofs and/or yards into the sanitary sewers. Inspections – over three metres. OSH regulations states that working at heights over three metres work is done safely. If climbing over three metres then OSH state – guarding, safety nets or fall arrest systems should be in place. This is impracticable in the situation of house inspections, therefore our policy is, that inspectors only climb as far as their ladders take them, keeping their own personal safety paramount. Reasonable access – areas where safe, unobstructed access is provided and the minimum clearances specified below are available; or where these clearances are not available, areas within the inspector's unobstructed line of sight. (a) Roof space – access manhole 450 x 400mm; crawl space 600x 600mm; height accessible from a 3.6m ladder or such other means of access that meet OSH requirements. (b) Subfloor – access manhole 500 x 400mm; crawl space vertical clearance timber floor 400mm (from underside of bearer) Concrete floor 500mm. (c) Roof exterior – accessible from a 3.6m ladder or such other means of access that meet OSH requirements. The writer was not present at the time of construction and cannot be responsible for failures if work was not done to manufacturer's specifications. We certify that we have undertaken this inspection independently of the Owner of the property or any other party to the property unless otherwise stated. Blue Gum Property Inspections limits responsibility to the client who commissioned this report only for their own use or for general maintenance/repairs and not to any third party including any vendors or proposed purchasers. This report must not be altered in any way whatsoever without the written consent of Blue Gum Property Inspections. Blue Gum Property Inspections accepts no liability for any alterations or renovations that don't comply with building permits or consents issued or for any defects concealed, unable to be seen or evident. A Land Information Memorandum from the Council may not disclose unauthorized work. This document should contain Building Consents or permits for any additions or alterations that may have occurred over the life of the residence. Your solicitor normally obtains a copy from the Council on your behalf. Clients should rely on their own judgment when purchasing a property. Cancellation Policy: If the inspection is cancelled up to 24 hours before the inspection is due to be undertaken, a fee of $100 will be charged. If the inspection is cancelled within a 24 hour period of the due date of the inspection, the full cost of the inspection will be charged. We reserve the right to apply this policy at our discretion. Payment Policy: Payment is due on delivery of the inspection report unless otherwise arranged. No Statement or receipt will be issued. All costs associated with debt collection will be added to the value of the invoice. Interest will be added at 2% per month for overdue accounts. This inspection has been undertaken in accordance with the guidelines as set down by Standards New Zealand NZS4306:2005. Copyright © 2013 Blue Gum Property Inspections All Rights Reserved.